Grinzane Castle is a journey back in time. When you approach it, you will immediately feel the past come alive in the face of the castle Grinzane. Overall the architecture of Grinzane Castle is melted like a wonderful beautiful natural area where it is located. Grinzane is located in the Italian Province of Cuneo, which is part of the northern Piedmont region. Grinzane is located only 50 km southeast of Turin and about 45 km northeast of Cuneo. Rising on a natural hill in the middle of the fertile pink arrays in the area, Grinzane Castle is an ideal holiday destination for the weekend. The kind owners of the Italian palace offers its guests the unique museum night in the first-class furnished rooms and culinary in the sophisticated restaurant where you can taste all the pleasures of the Italian cuisine. Grinzane Castle is the main tourist attraction into the same Italian village. This medieval castle resembles more of a family mansion, but its observation towers have engaged in heavy battles and struggles for power and territory. 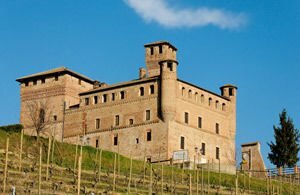 The original name of the castle is only Grinzane, but later it was renamed Grinzane Kovur in honor of Camillo Benso, who was mayor for 17 years in this this area of Count Cavour in Northern Italy. Camillo Benso had a motto that was: "A man who trusts men will make many more mistakes than those who doubt". This opinion concerns the relationship of the ruler of Grinzane with local producers and landowners. The Grinzane Castle was built sometime in the 13th century and when Camilo stays in it he put paneling and suspended wooden ceilings in all rooms, which are used because the stone walls of Grinzane were tough and quite compatible with the winter cold. During the second World War, this proved a bonus for the soldiers who made an effort to burn it. Today, Grinzane is the main headquarters of the Italian producers of wine, as there it hosts different tastings and wine festivals. The room for the wine passes through a balcony, and thus you find yourself in an interesting museum of agricultural implements. Each tour in Grinzane ends with the obligatory glass of good Italian wine from the cellars of the castle.